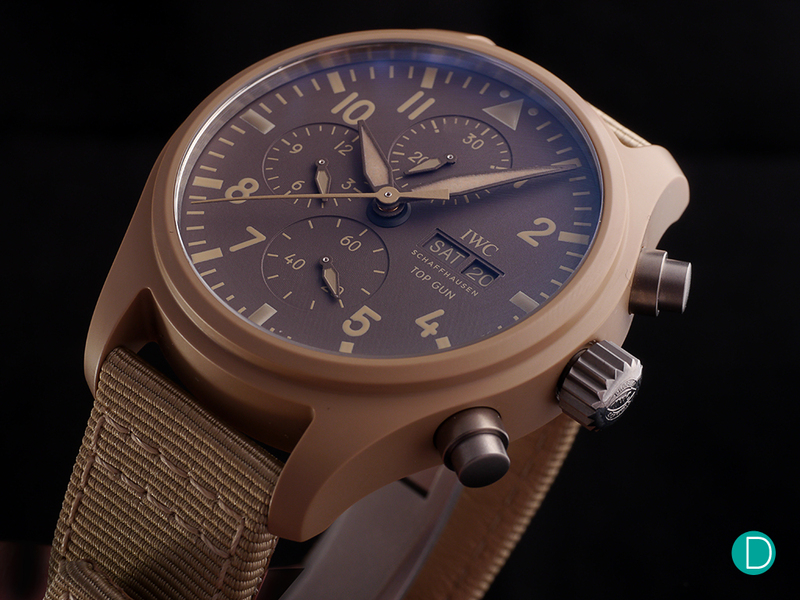 The Pilot’s Watch Chronograph TOP GUN Edition “Mojave Desert” (Ref. 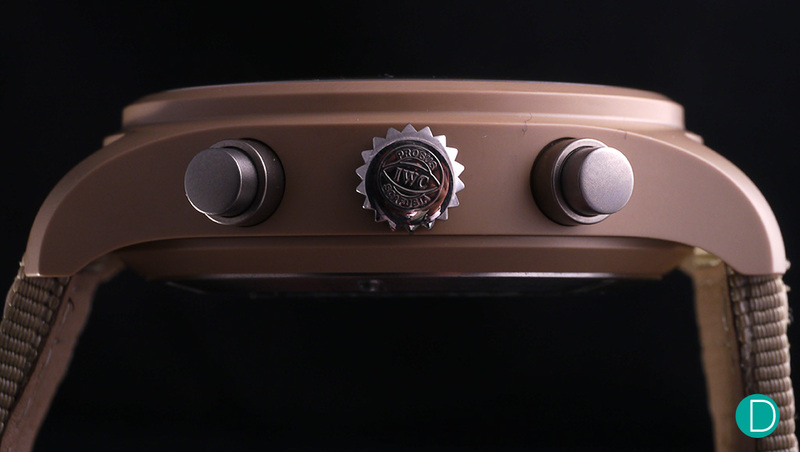 IW389103) is the first watch by the brand with a case made from sand-coloured ceramic. This reference is limited to 500 pieces. 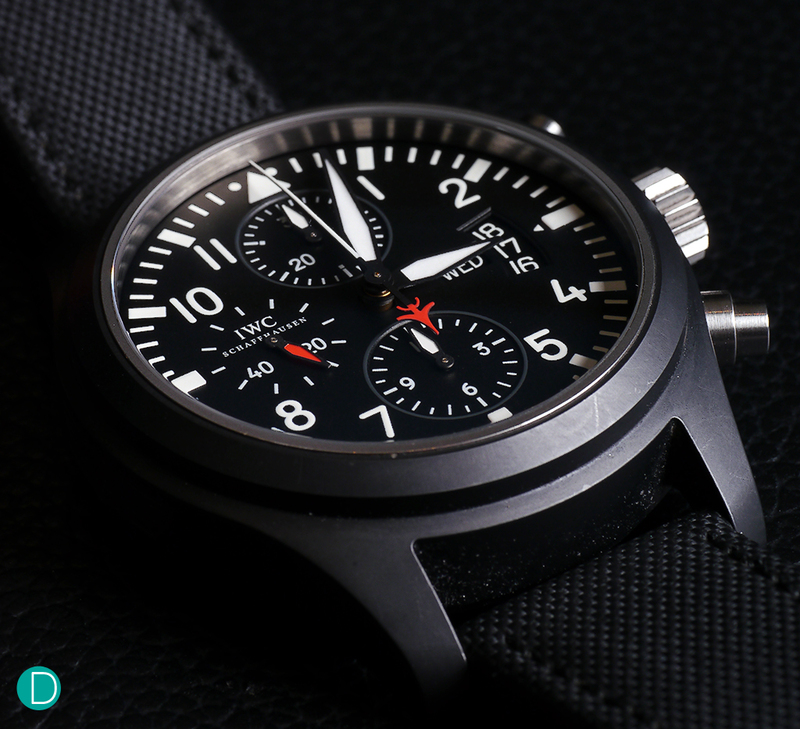 The Chronograph TOP GUN Edition “Mojave Desert” uses similar case dimensions as the previous TOP GUN black ceramic reference IW3789-01 which was fit with a Valjoux 7750 movement. It measure 44.5 mm in diameter and 15.7 mm in height. 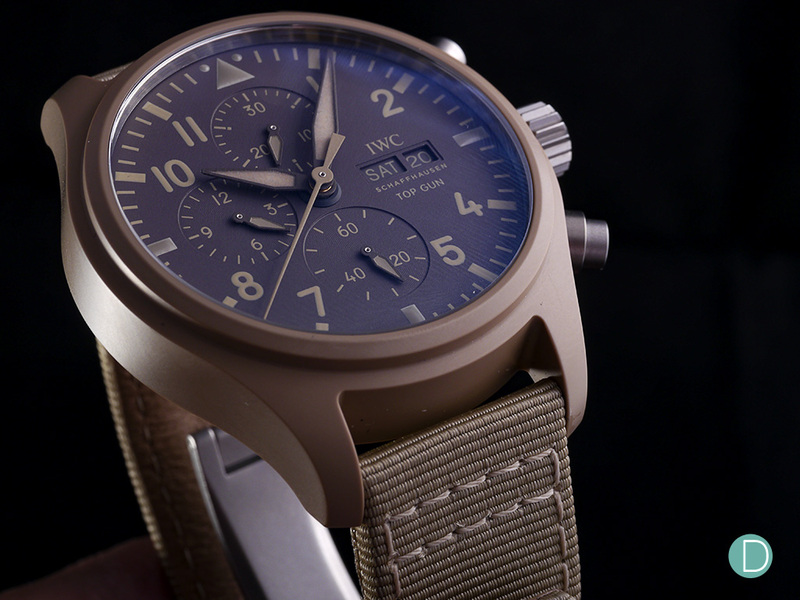 Unlike the older model which uses a 7750 movement, the new “Mojave Desert” is powered by the 69380 IWC-manufactured calibre. The chronograph movement with a classic column wheel design has both a chronograph function and a display for the day and date. The pawl-winding system winds up in both directions and has a power reserve of 46 hours. 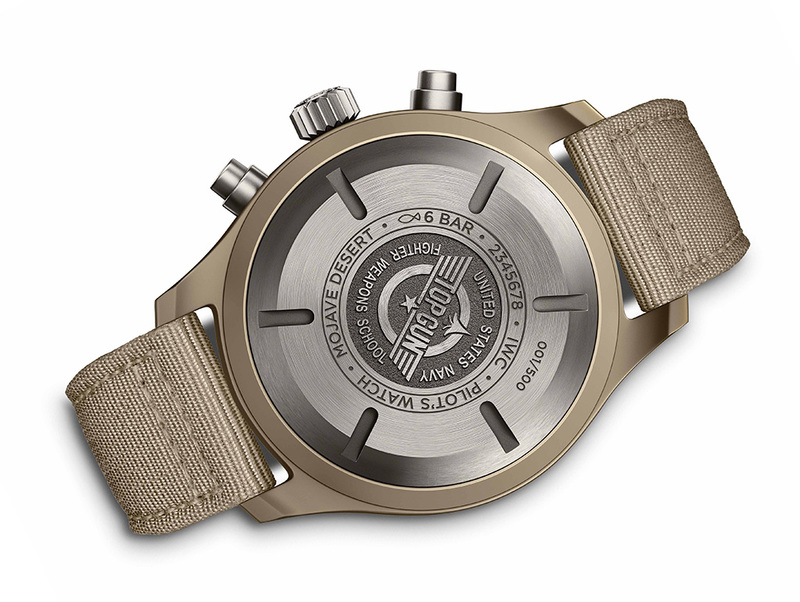 The watch is fit with a sand-coloured ceramic case, titanium case back, dark brown dial, sand-coloured hands and a sand-coloured rubber/canvas strap. Apart from a new in-house movement, the “Mojave Desert” also removed the 3 date window display which was frequently ridiculed by critics for its apparent pointlessness. The glass: Sapphire crystal with an arched edge and anti-reflective coating on both sides. The sand-coloured ceramic is inspired by the Mojave Desert, home to the Naval Air Weapons Station China Lake – the largest land area of the U.S. Navy. The colour perfectly matches the uniforms worn by Navy pilots and is the result of a combination of zirconium oxide with other metallic oxides. From the side, featuring pump pushers with pusher guards, and a screw down crown. 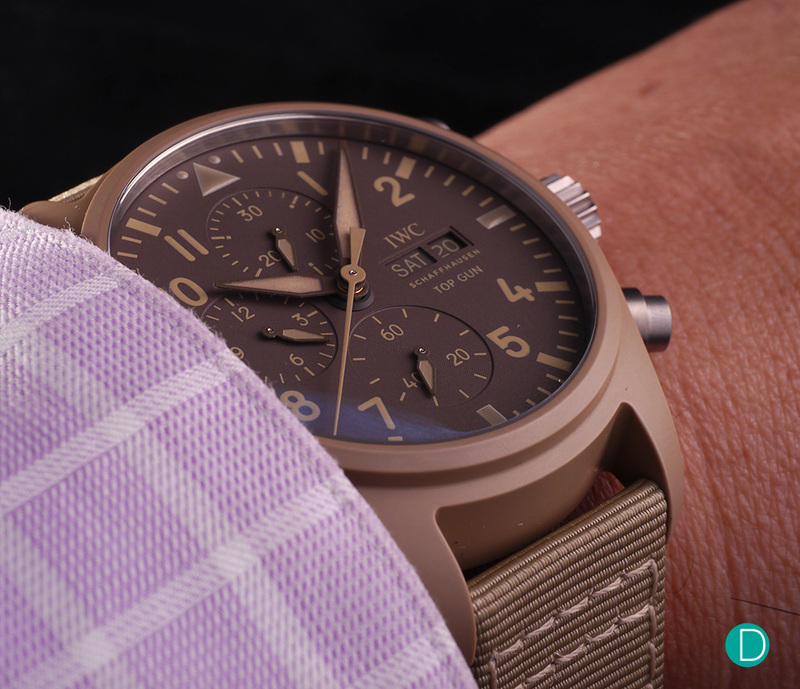 The unusual case and dial color is a welcome variant as a modern addition to the Pilot’s line. 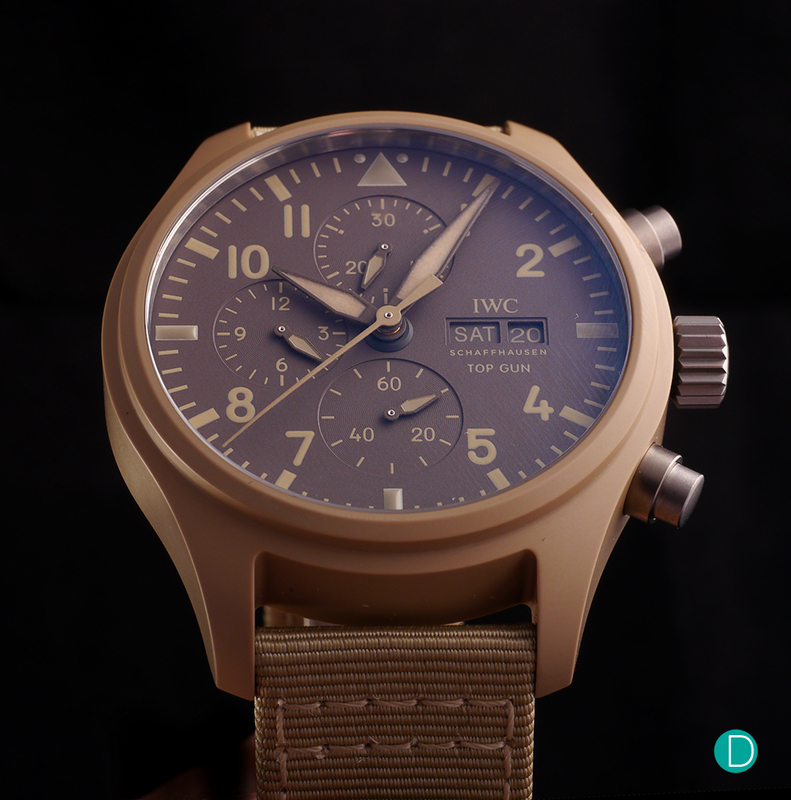 While attractive in its own rights, IWC’s last rendition of a limited run of a bronze case patina lume Big Pilot Heritage in 2018 was relatively formulaic and lacks the creativity the “Mojave Desert” picks up. The watch wears the same as the previous Chronographs, with proportionate heft for a modern ‘sports’ theme watch. The watch is priced at US$8,200 and will be available from April 2019.